Raise Visibility, Create Buzz, and Generate 65% to 300% More Leads! Your trade show exhibit is magical. It can do two tricks — either make new leads appear, or make money disappear. With today’s tightened belts and budgets, it’s more important than ever to make sure the money your company invests in exhibiting at trade shows isn’t simply vanishing into thin air. Joe M. Turner attracts crowds to your booth by integrating your sales and marketing messages into his customized sleight-of-hand and mindreading presentations. These high-impact presentations boost your booth’s visibility while allowing him to qualify leads for your staff to target. Your exhibit will be an engaging, interactive experience that will get your message seen, heard and remembered by more people. That’s the kind of effective exhibit that your company deserves to have. Follow up by adding Joe’s award-winning close-up magic to your hospitality suite. Your clients and prospects will remember the fun and amazement they had at your hospitality suite where they experienced unforgettable world-class magic. The industry research firm Exhibit Surveys, Inc. reported that magic is one of the top two attention-getting techniques used at trade shows. Imagine how much more effective your booth will be because you have an engaging attraction that is tailored to deliver your most important business messages to your prospects. Each product and service you offer has a magical message that Joe will uncover and put into action drawing crowds to your booth. Working with your marketing or sales team, Joe customizes his magic presentations to incorporate your information relevantly and accurately. Whether attracting attendees with close-up magic at a podium, or performing front and center on a platform or stage, Joe’s expert magic and showmanship transform your booth into a powerful marketing attraction. Combining professional sleight-of-hand skill with solid corporate experience, Joe’s magic will attract the prospects to your exhibit. His polished presentations will get your message across clearly and memorably. And you get to watch Joe’s best trick of all… magically turning attendees into leads. 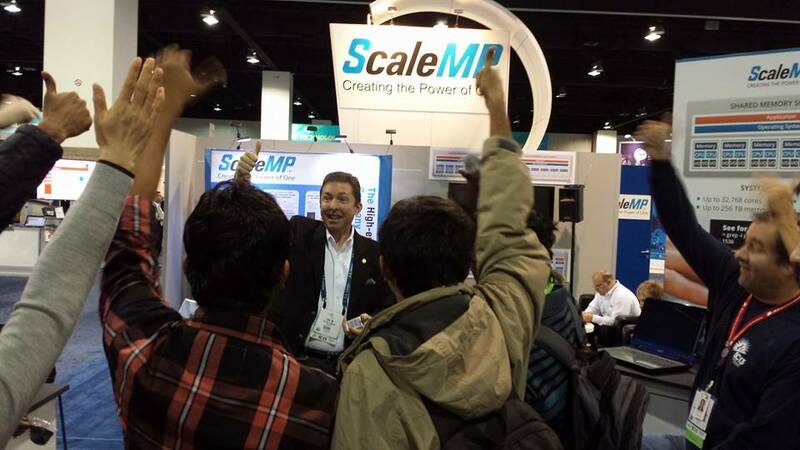 Trade show magician Joe M. Turner gets the crowd pumped up for ScaleMP at a supercomputing conference in Denver. Atlanta Magician Joe M. Turner attracts crowds for Biosound Esaote at a trade show in Orlando.